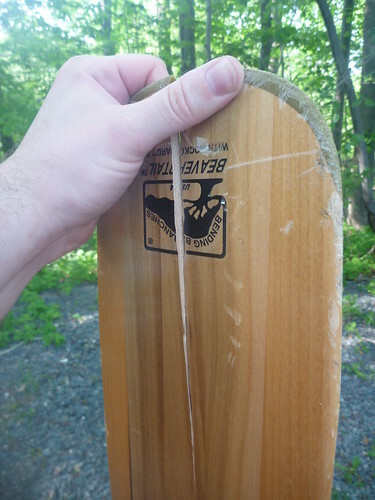 Here's the damage that was done to my paddle on the camping trip the other weekend. I picked up another beavertail paddle and a bent-shaft wide-bladed paddle to replace it. Now I just need to figure out what to do with a broken paddle. Open the gap with a wedge, drop wood glue in it. Press it back with clamps and/or rope. Once dried sand it down, protect the joint with epoxy, sand down again and refinish with polyurethane et Voilà !